The aim in CCI is to help you raise self-confidence, self-esteem and your ability to grasp life fully, helping you live autonomously, creatively and in touch with your emotions. CCI co-counselling is a therapeutic tool that aims to help you find out more about who you are and how you operate. It enables you to discover and acknowledge your real, profound and everyday feelings, and to work with them to achieve greater emotional well-being and better relationships of all kinds. CCI challenges the view that some feelings are taboo or ‘wrong’ and that you should not have them. It can help you come to terms with your past and your present, so that difficult feelings have less of a grip on you. Two co-counsellors divide up their session time equally, taking turns to be either the person doing the listening/helping (‘counsellor’, for want of a better word) or the person working on himself or herself (‘client’, for want of a better word). It can take place in a group too, at the many events that we hold. It’s peer-to-peer: co-counselling is a practice of structured working with equals, which, after training, you can use for the rest of your life, working with one or more co-counsellors, in a safe and supportive framework. Using the repertoire of co-counselling methods you can choose to work on your self, and change the way you are in the world. Co-Counselling is a powerful and accessible form of therapy with a 39 year history. It draws on a range of approaches – Gestalt, Catharsis, Psychoanalytic, Person-Centred, Process Oriented Psychology (POP), Cognitive, and Reichian. It focuses on both body and mind to produce insight. 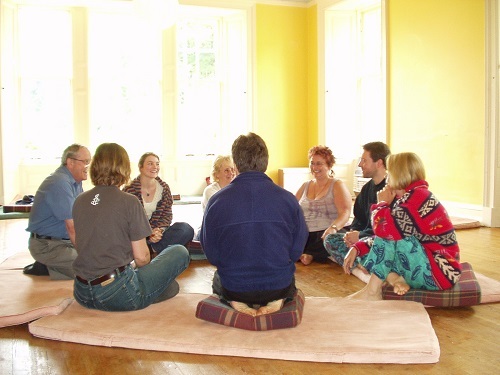 Whilst the foundation course is aimed to be a therapeutic experience in its own right, it gives participants the skills to continue to use co-counselling for their own personal development afterwards. Re-evaluation or review of the truth about who I am and where I come from: making sense of my present behaviour and relating it to both my current life and to my past. Co-counselling International aims to encourages a culture of validation. Being direct with people about our positive feelings is something that can feel very difficult: it can be difficult both to give and receive compliments and appreciations. This is something that is worked on in co-counselling: we actively celebrate ourselves and others. This can feel like a big challenge, and the co-counselling course helps work on this. I have drawn immensely from this culture: it has helped me rise above my inner shame and self-doubt, move away from embarrassment about telling someone what I like about them, and has helped me move towards enjoying success and being proud of who I am. There is also an important fun element in the co-counselling culture, so we play games and enjoy ourselves in a celebratory way too – it’s not only about looking at our serious sides. At the residentials there is often a DIY caberet: if you decide to take a turn it can feel like you are in front of the most sympathetic audience in the world.